Squadrons at Fiskerton,1943 to 45. Images Page 2, Main Airfield. Images page 3, Main airfield. 49 Sqn Sgt. E.B. (Ted) Cachart. 49 Sqn Pilot Officer Edgar R. G. Haines D.F.M. 576 Sqn Flt/Sgt Ken Tamkin. 49 Sqn. S/L J.E Raw-Rees D.F.C. 576 Sqn. Sgt. George Lynn. 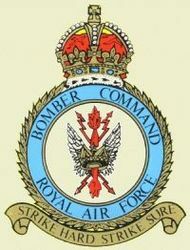 A website about an old Bomber Command airfield in Lincolnshire. SINCE THIS WEBSITE WAS CREATED, A LARGE AMOUNT OF NEW MATERIAL HAS BEEN SUPPLIED TO US AND IT WAS DECIDED TO CREATE A NEW WEBSITE FOR THE NEW MATERIAL AND TO RUN ALONG SIDE THIS ONE. AFTER BROWSING THIS WEBSITE PLEASE SELECT THIS LINK AND GO TO: www.raffiskertonairfield.co.uk. THE PAGES ARE CONSTRUCTED USING A FLIP BOOK FORMAT WHICH REQUIRES ADOBE READER. THIS CAN BE OBTAINED FREE ON THE INTERNET, A LINK IS PROVIDED. PLEASE E-MAIL FOR FURTHER INFORMATION. During the second world war, RAF Lancasters flew from this airfield on operations. With their crews of seven, one-hundred and seventeen of these Lancasters would never return. Night after night in the cold black hostile skies above enemy-occupied Europe, a deadly war was waged between enemy forces on the ground, roving enemy night-fighter aircraft and our allied bomber crews. Using complex state-of-the-art electronic counter-measures and human vigilance, remaining undetected was vital. Detection was almost always fatal and often, the first the bomber crews would know of their detection was the sudden burst of gunfire which would rip their bomber apart.Equally deadly, were the searchlights on the ground. These could trap an aircraft in their beams-illuminating them for the flak guns or the night-fighters. 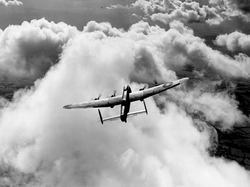 During the bombing campaign of the Second World War, the duties that the crews of Bomber Command were expected to undertake was considered so dangerous, even by wartime standards,that the bomber crews were made up entirely of volunteers. Each man was obliged to complete a thirty- mission tour of operations. The life expectancy of a crew was just five operations. Given that aircrew training took two-years to complete and given that the crews were operating the most sophisticated and reliable tool of war devised to date-namely the Lancaster bomber, highlights just how hazardous and difficult bombing operations were.The eventual loss calculations, which consisted of operational and training losses, serious physical and mental injury was finally calculated at 75% of every 100 who flew with Bomber Command in the war years 1939 to 1945. � All the images and information on this website are the interllectual property of Martin Nichols and David Briggs, Anyone wishing to copy material from this website must contact the webmasters for permission via the e-mail links below. July 2006. Much of the information on this website has been taken from eye witness accounts and records which were made over sixty-five years ago. Inevitably, errors do occur. Would anyone who finds any inaccuracies in the information on this website, please contact the joint webmasters via the e-mail links on this page and the errors will be rectified immediately. Anyone visiting this website who has information/photographs of the airfield, either wartime or post-war or former veterans who were stationed at Fiskerton and who would like to add this information or photographs to the site, please contact the webmasters at either: (Martin Nichols) or: fiskerton202"at"hotmail.co.uk (David Briggs)Credit to the sender will be given if desired.Information/photographs can either be posted or sent via e-mail. Posted material will be returned immediately upon scanning.